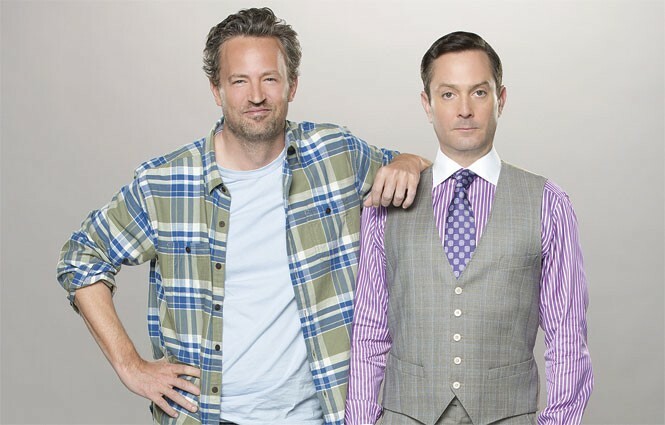 Series Debut: Like CBS' recently canceled The Millers, The Odd Couple (a remake of a '70s sitcom, kids) is a case of a killer comedic cast (Matthew Perry, Thomas Lennon, Lindsay Sloane, Wendell Pearce and Yvette Nicole Brown) saddled with an annoyingly laugh-tracked, numbingly beige network sitcom. The song remains the same: Oscar (Perry) and Felix (Lennon) are old friends who move in together after their respective marriages fall apart; Oscar's a slob of a sports-radio host (updated from sports columnist because, as you know, print is dead), while Felix is a borderline-OCD clean freak. Wackiness, etc. Despite his many post-Friends flops, Perry can still bring the funny, and Lennon (who will always be Reno 911's Lt. Jim Dangle) is an underrated master of cuttingly subtle humor. Even if they don't eventually overcome the show's lazy writing, The Odd Couple will still be CBS' least-terrible comedy. So that's ... something. Series Finale: The question isn't so much "Will Charlie Sheen return for the finale?" as it is "Who cares anymore?" The end of Two & a Half Men should have been Season 8, Sheen's last, when show creator/hack Chuck Lorre and Warner Bros. Television had 177 episodes in the can so the sitcom could easily live on in $yndication perpetuity. But no, here we are in Season 12(! ), still printing money with Ashton Kutcher, the Ghost of Jon Cryer and no Half Man. So, tease Charlie "Harper" Sheen's possible comeback all you want, CBS—just get this over with. Season Premiere: In Season 3 of Vikings—aka Game of Thrones Lite, Sons of Anarchy With Swords or The Last Somewhat Historical Show on the History Channel—Ragnar (Travis Fimmel) is now the King of Denmark, having dispatched Horik to a better place (well, to Gotham, where Donal Logue now resides). His first move? Attack Paris! Sounds accurate—didn't a Dark Ages baguette turn up on Pawn Stars recently? Special: What's on tonight besides the fashion show that calls itself the Oscars: new episodes of The Walking Dead, Talking Dead and Comic Book Men on AMC; Jinx: The Life and Deaths of Robert Durst, Girls, Togetherness, Looking and Last Week With John Oliver on HBO; Downton Abbey and Grantchester on PBS; Bar Rescue on Spike; Total Divas on E! ; and, if you must, Sister Wives on TLC. I'd also recommend the recent stand-up comedy specials of Iliza Shlesinger (Freezing Hot), Bill Burr (I'm Sorry You Feel That Way) and Chelsea Peretti (One of the Greats) on Netflix. We good? Series Finale: So nevermind what I said in January about the seventh season of Parks & Recreation being unnecessary; as series finales go, it's been a wonderfully weird trip for NBC's Last Great Comedy (trust me, there's nothing funny coming in the pipeline from The Peacock anytime soon). So long, Leslie, Ron, Ben, April, Andy, Donna, Jerry/Garry, Ann, Chris—hell, maybe even Tom.